Driving through Illinois can be a memorable experience. Of course, you’ll want to rack up some mileage on historic Route 66, also known as “The Mother Road”, long immortalized in music and film. As you travel through Illinois, be aware of its own unique set of driving challenges. With a population of almost three million, Chicago’s streets are packed with large volumes of traffic. Compare that to the scenic countryside where you need to be on the lookout for farm animals suddenly in the middle of the road. Wherever you travel through the Land of Lincoln, it’s a good idea to be prepared for the unexpected by having proper car insurance coverage. Here are some interesting facts about owning a car in Illinois. 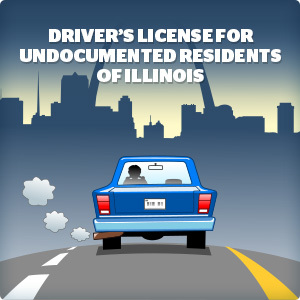 Illinois randomly selects drivers to verify they have proper car insurance. If selected, you’ll receive a letter asking to confirm your coverage and respond within 30 days. When you sign your vehicle registration renewal form, you’re also promising that the vehicle will be insured during the entire registration period. Not carrying auto insurance in Illinois could result in your license plates being suspended or receive a minimum fine of $500. Driving with a suspended registration could result in a $1,000 fine. Unlike other states, Illinois does not accept bonds or cash deposits from drivers in place of carrying a liability policy. Illinois requires drivers to have liability insurance. Your license plates will be suspended and your vehicle is prohibited from being driven. The suspension stays in effect until you prove that you meet the minimum insurance requirements, and pay the $100 reinstatement fee. If you’ve been guilty of driving without insurance before, your plates will be suspended for at least four months. Driving along Route 66 is an experience not to be missed. Make sure you can enjoy it worry-free by having good car insurance in Illinois coverage. Enter your zip code above to request a free Illinois car insurance quote or give us a call at 800-777-5620. *Please note state minimums may change from time to time. Check with Illinois DMV if you have additional questions about current state minimums.